Now that it’s mid-July your flip flops, which showed show so much bright summer promise back in May, might be getting a little worse for wear. And if you’ve had your flip flops for a few years, they might be ready for retirement. Well guess what? We can recycle our flip flops. Yippee! The good news? Unique Eco Designs takes flip flops that wash up on beaches (and old pairs that you send in) and turns them into funky art. They provide much needed jobs to women and children, and help support the local economy. They also donate 9% of the sale from your flip flops to charity. The bad news? They’re in Kenya, which means we have to mail our flip flops half way around the world. So, does mailing flip flops so far take away the goodness you’re doing by recycling them? I’m not sure, and don’t even know how to calculate the impact of either choice. Hansen’s Surf Shop in San Diego, CA is collecting used flip flops to send to Unique Eco. So, sending them in bulk through Hansen’s would, I think, negate the environmental impact of all of us sending them one pair at a time. It seemed natural that we should become UniquEco’s first collection source in the U.S. After all, we are StyleSubstanceSole – oops, Soul. We’re all about doing good. And because we live in Southern California – the land of flip flops – what better place to make a real impact? We could actually help reduce landfills one flip flop at a time. Hansen’s, thanks for being so cool to send in our flip flops for us. You rock big time. Do any of you know more places that take flip flops for recycling? Know some ingenious ways to reuse them at home? If so, send them in! My flip flops are looking pretty scruffy, so I’m thinking that next month they’ll be on their way to San Diego! I went to the website and wanted to look at the art but couldnt find it easily. The gallery showed all those flip flops washing up on the beach. Anywhere I can look at the art that you know of? This is very cool. I’d like to get an East Coast surf shop to participate too! I have a pile of sad flops looking for a new purpose. It was hard for me to find the specific art too; they did make this really cool giraffe out of 10,000 recycled flip flops for Rome’s Fashion Week, which you can see under the “projects” link. What a great idea. Flip flops don’t last long around here. Crocs will take back their brand for recycling. Just wish that would include a small discount when purchasing a replacement pair. Was wondering if you’d found any other places (notably in the US) that will actually grind up flip flops to re-cycle the rubber materials? Nike has a program that is reported to use 100% of the materials from athletic shoes to create athletic surfaces (apropos), so I’m wondering why flip flops can’t be sent to the same program? Here’s a link to the Nike program. 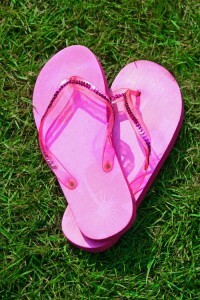 Do you know if the flip flops can be recycled (ground up, re-used) in the US? Nike Re-Use a Shoe (http://www.nikereuseashoe.com/) won’t take them and so far as I know (and stated on their site) other shoe companies aren’t recycling. Thanks for the info! I was so sad when my well-loved flip-flops finally bit the dust, but at least now I know they’ll go somewhere good. I purchased several pairs of flip flops for a program, which didn’t work out. So now I am left with tubs of them. I was wondering if there is a place where they would purchase them from me to be recycled. Terracycle has a flip flop brigade and they do recycle flip flops. You need to collect and ship at least 25 pair. Once you join their free brigade, you may print the postage paid shipping label online. TerraCycle no longer has a Flip Flop Brigade. I hope Hansen’s Surf Shop is still taking them.